We had not just one but TWO Wednesday websites this week at Centennial. This week’s first Wednesday Website was shared by Centennial’s very own school psychology intern, Emily Gallagher. Emily discussed Wizer.me, which can be used to create worksheets for students. Great news: It’s affiliated with Google, so you can assign the worksheet through Google Classroom. It’s a great site to make worksheets visually appealing & fun. Other tools include the ability for students to record their responses, sorting, and labeling of pictures. You’re also able to differentiate instruction on wizer.me, meaning some students can be provided with different information or prompting based on their ability level. Unfortunately, students will have to sign in using their school account at Wizer.me (one extra step when accessing the worksheets through Google classroom.) Wizer.me is free. This week’s second Wednesday Website was shared by Centennial’s very own high school teacher, Josh May. His website, Quizzalize, is a great alternative to Kahoot. It is a website in which students are quizzed on content, but the students do not see one another’s answers and it is completed independently. Like Kahoot, students login using a unique code in order to play the game. Students are provided with immediate feedback if their response is correct or incorrect. If incorrect, they are immediately provided with the correct answer. Student responses can be tracked and monitored; without the hassle of students possibility worrying about the competition. Teachers create a Jam by inserting blank pages or pages with content. Teachers share the Jam through Google Classroom or through a Jam code. Through Google Classroom, teachers can allow students to edit the same Jam or make a copy of the Jam for each student. Students access either the shared Jam code or by logging into their Google Classroom. Students can annotate and add in drawings, text, sticky notes, images, and documents from their Google Drive. Jamboard works best on a mobile device to access all of the features. 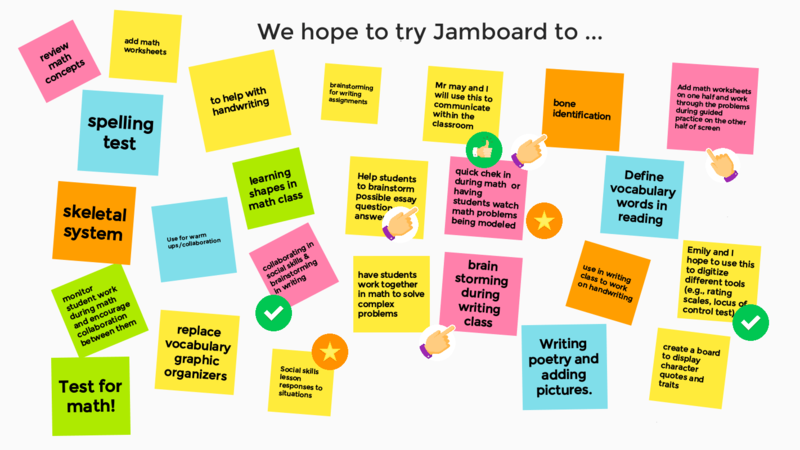 You can also access Jamboard through the website, although the features are limited. Looking to get started? Here are some helpful YouTube videos. Below is a list of ways we hope to use Jamboard throughout this marking period. This week’s Wednesday Website was shared by high school Lead Teacher Sara Vanderbeck. EquatI0 is a great extension for Google Docs, Slides, and it also has its own app. EquatI0 can actually transfer written information into text form. No more worrying about typing up your written math notes — simply place them into this add on. This could save math teachers a whole bunch of time!